Slot machines hardly need an introduction as they are the easiest casino games have been ever invented. The history of casino slot machines is very short but despite this fact slots are the most playable games today. It is not surprisingly because being very simple slot machines are very dynamic and interesting games. Today slot manufacturers do their best to create modern unique machines. As the result there are slots with different themes for men and women. Besides that there are many bonuses you can get playing casino slot machines. So, let's start from the very beginning. The aim of the game is quite simple: you need to get the symbols in the order mentioned in the pay table. The types of slots and payout percentages are endless as well as denominations. You can play not one pay-line but several of them up to 100. The payout rate can reach 99% at online casinos. There are slots with different denominations varying from a penny to several dollars per spin. The main rule of slot machines is there are no rules. These games are of pure chance and have nothing in common with casino table gambling. In order to play slots you have to choose a machine insert a coin and push a button or pull a lever to activate the reels. The pivot of the game is the right choice of a slot machine as it immediately affects the result of your game. 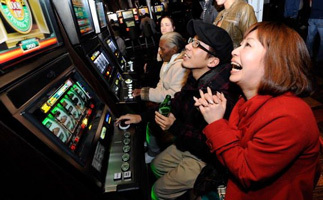 Modern technologies have given the opportunity to create computerized slots that have a lot of options and features that make the game even more interesting and challenging. Commonly, there are 3 and 5-reeled slots with numerous pay-lines. In most video machines winning combinations can appear not only on the horizontal lines but vertical and diagonal as well. There are symbols that have some additional functions. They are scatter, wild and bonus symbols. All of them will help to increase your winning potential, so look for games with these symbols. Wild symbol can replace any other one to complete the winning combination. Scatter symbols can appear on any of lines and bring winning. Bonus symbols will give you free spins, a game within your game, etc. Playing slots you can count on generous bonuses especially at online casinos. At real houses you use your club card to accumulate points and exchange for supplementary services. Playing online you will get sign-up bonus for registration, monthly, weekly or surprise bonuses for playing at a certain casino. Before you insert the first coin we recommend you to read tips how to beat slots and avoid mistakes. Read rules and make sure you understand them clearly.